Fall invites us to seek warmth from the oven and celebrate the steam rising from the tea kettle spout. We gravitate toward flavors that are comforting and richer in flavor. But before you reach for your stalwart spices, step back and turn toward your teacup shelf to find a spice that's been there all along. Often reserved for the cup, tea can perform well beyond its solo act in your morning routine (maybe with a brief appearance of milk and honey). With an array of flavors tucked into each leaf, the adventure of cooking with tea knows no bounds. But before you head to your cupboard and reach for your favorite steep, there are some ground rules to follow for the best tea-infused treats. First, always use good tea. What does that mean? Fresh, whole-leaf tea that's bursting with flavors, not the dust often used in the teabags from the grocery store with which we are all familiar. Low-grade, finely cut tea dust will impart a flavor that is flat, one-note, and stale. Imagine cutting an apple into small pieces and leaving it on your counter to brown, dry up, and lose flavor (akin to conventional bagged tea). Now imagine a fresh apple from a farmers' market that is juicy and full of distinctly unique flavor (think tart Granny Smith to sweet honey crisp, etc.). That flavor sensation is what you will experience with fresh, whole-leaf tea from trusted sources. Quality counts, so be sure to seek it out at a local tea shop or premium grocery store, where options are improving each day. Next in the rule book are temperature and time. Whether you are steeping a cup to sip or mixing tea into your favorite dish, the way in which the tea is treated will reward you in the end. A prime example is a delicate green tea that needs to be steeped in water well under boiling so as to not burn the leaves and extract a bitter flavor. Time follows the same notion. If you oversteep your tea, the flavor will not be stronger but rather too tannic and with an unpleasant astringency. Keep in mind that there is more leeway when cooking with tea since there are so many additional flavors. But the rule should still be loosely observed for the most delicious outcome. Now that we have covered the basics, let's push aside the concept that cooking with tea is complicated. It can be as simple as replacing flavorless water with steeped tea when cooking grains, or infusing milk with tea in recipes that call for dairy. Start there. With the recipes featured here, you will flex your culinary muscles a bit more. But begin where you are comfortable, such as sipping your way through teas to identify your favorite flavors. Try pairing teas with nibbles and bites of ingredients to see what sparks your taste buds. Hojicha tea miso honey butter chicken. Just like your trusted spices, tea can play many roles in the dishes you create in your kitchen. Tea can enhance a dish and quietly balance flavors without being the shining star (like in the hojicha green tea miso honey butter roasted chicken recipe). And with a recipe like lapsang souchong black tea pickled cauliflower, the tea can proudly bellow its name and grandly announce its inherent smoky nature. The classic bold and bright notes of zesty Earl Grey tea adds a bright finish to this Pear Galette recipe. 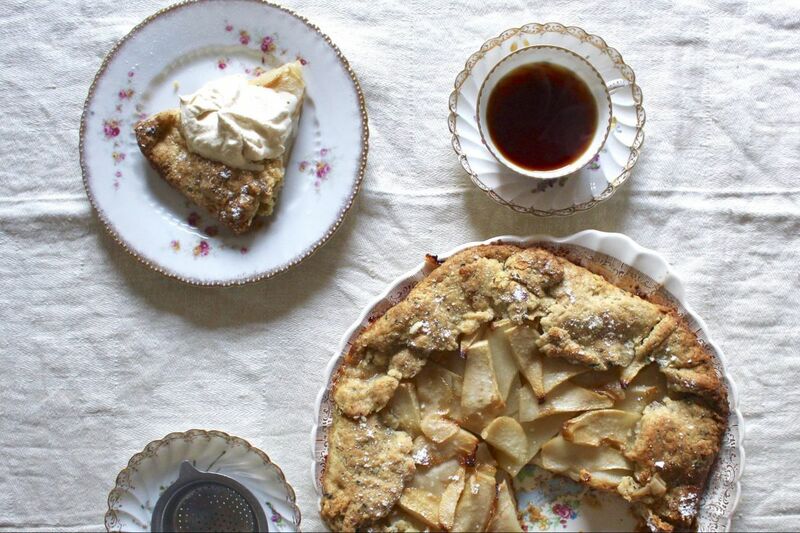 Infused in three ways, you'll find the tea in the crust, the glaze and the whipped cream. Similar to your spice routine, some teas will have more of a pronounced flavor and astringency than others (think bold black tea over a delicate green). So you will always want to consider how you might increase or decrease the quantity of the tea, water temperature and steep time to properly infuse the tea. May this steeped journey open your eyes to possibilities of tea leaves both in your cup and on your plate. And as you patiently wait for the cauliflower to pickle, chicken to roast, and galette to bake, you can brew yourself a cup of tea and drink in the autumn season. Alexis Siemons is a tea consultant, writer and teacher. Visit her website, www.teaspoonsandpetals.com. Note: Hojicha green tea can be purchased at La Colombe cafes and on through the company's website. Lapsang souchong tea and Earl Grey tea is available for purchase at Premium Steap locations and on its website.